"... Devilishly talented saxman. Superb horn work and steaming grooves that will catch the ears and stir the feet of rock, blues, R&B and jazz fans alike"
Almost 20 years on the road.. and counting! Johnny has spent most of the last 2 decades touring throughout Europe, Canada and the US. Also an original menber of Colin James and The Little Big Band, opening for, and sharring concert stages with ZZ Top, Robert Plant, The Rolling Stones, Keith Richards, and Stevie Ray Vaughn. 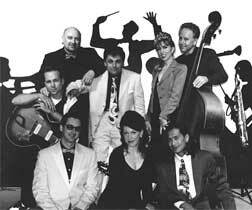 "While touring across North America I managed to find a lot of Louis Prima records and some Louis Jordan compilations, Cab Callaway, and was enjoying what Brian Setzer was doing with his big band... ours was more of a little big band! This is where big band swing meets rhythm and blues." The Little Big Band was born. "Count Basie was one of the first, if not the first big band leader to downsize his big band because of the economical touring constraints of the 1940's. The idea was to take one horn from each of the sections; trumpet, trombone, and saxophone together with the rhythm section of piano, bass, drums, and sometimes guitar and singer. The instrumentation was the same as his orchestra but with a lot less horns. This was the birth of The Little Big Band!" "Most of the songs on this CD are reflective of the big band swing sound. We also covered one of my favorite Louis Prima songs "Dig That Crazy Chick", love the horn arrangements on that." R&B and jazz fans alike"
page which has more song samples as well. I mentioned to someone I work with that I have a thing for swing and for the sax so he gave me this C.D. I tell ya' I didn't know just how much of a thing I had until I heard this. I was instantly blown away. Johnny Ferreira REALLY IS the king of the sax! Now I want more! If you dig Freddie Bell, Sam Butera and Jimmy Cavallo this CD's for you! It's a non-stop retro jitterbug hop from start to finish - you just can't find this music any more so do yourself a favor and pick it up for your next party! High Energy Swing that definitely makes one want to dance! If you are ready to dance then get ready! This CD is packed with high energy swing beats. Definitely worth the money. Music that is upbeat enough to turn a cloudy day into a festive mood. Thank You King of The Mood Swings! I highly recommend this c.d. to anyone who likes to have a really good time. I received mine about three months ago and haven't stopped listening to it yet. I take it with me wherever I go and am constantly turning people on to it.